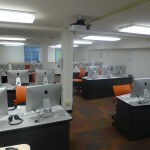 The Microroom is 24-hour computer lab, equipped with iMacs that have dual-boot Windows capability. 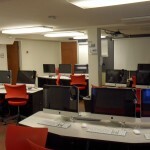 It is also used as a classroom for certain courses that need to use a large number of computers. Come down and try out some of the Microroom iMacs that have all the creative programs you need to work on any sort of project (iMovie, Photoshop, InDesign, Illustrator, ComicLife, etc.). The microroom also has no official closing time, though students can’t access the main Bosler doors after 11:00 pm, meaning that you can stay all night working on your media projects, provided that you get here before Bosler closes. 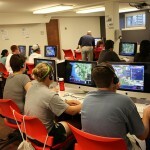 Check out below a class using the game Civilization IV.